Come Graze on all Kandiyohi County has to offer at this tasty event happening in the casual surroundings of Stacy’s Greenhouse in Willmar. Specialty appetizers, sauces, dips, soups, snacks, grilled sandwiches, sweets, treats, coffees, wines & cider and much, much more. 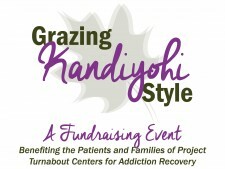 It’s our 3rd annual “Grazing” event, discovering more Kandiyohi County local eateries and food finds each year! Cost is $35. You won’t leave hungry! Funds raised benefit Project Turnabout Willmar projects. Come experience the widest variety of Kandiyohi’s eateries, caterers, restaurants and food creators all under one roof. Tickets are $35 and can be purchased at Stacy’s Nursery, online here or by calling 320-564-4911. More information can also be found on the Facebook event. *If you are unable to attend, but would like to Donate, please contact Lois Schmidt or Marti Paulson. *Tickets are also available at the door.